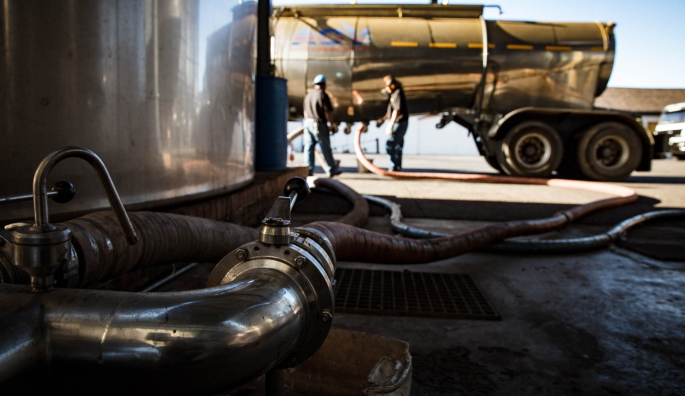 In our third "From Vine to Bottle" article, we take an in depth look at Distillation, the mysterious yet critical step in the Cape Brandy production cycle. Once shrouded in absolute mystery, and mastered by only a few enlightened “Alchemists”, the process of distillation is now scientifically understood. But the elemental chemistry at play during this process is volatile, and leaves a certain amount of its cards hidden from the the eyes of science – while we know exactly what’s happening during the process, it’s never possible to 100% predict the final outcome. Step one 1. Filling the copper potstills. 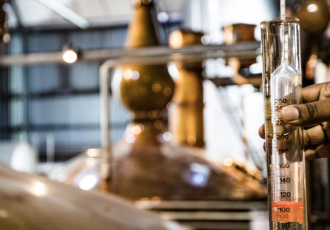 The most important distinction to make when producing Cape Brandy against other styles of South African Brandy, is that it is 100% distilled in potstills, and done in two distinct batches. The wine that has been received into the stainless steel holding tanks, is pumped with lees (settled out yeast and other particles) into the potstills, and the heat is switched on. 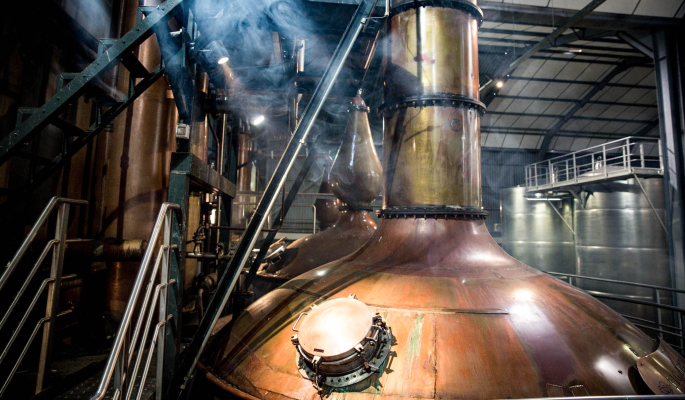 The great gleaming copper stills at the Oude Molen Distillery are heated by steam, generated by an enormous coal fired boiler. The steam passes through jackets in the potstill, between the copper layers and slowly heats the wine inside through the various temperature stages of evaporation. The wine is slowly heated until the point where the volitile substances contained in the wine (that boil at a lower temperature to the water) start to evaporate. 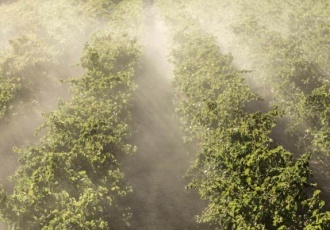 The initial gasses that come out of the wine are not wanted in the final brandy, some are very bitter and sour flavoured, others can be poisonous in large quantities. Knowing at what temperature these substances evaporate out of solution is critical to successful distillation of the wine. As the vapours rise up the potstill and into the neck, they are captured in the condenser, and then cooled by water again to force them to condense back to liquid once more. This liquid is either captured or discarded as it runs out of the still, the process of deciding what stays and what goes known as “Cuts” and is determined mainly by temperature. The output of the first distillation is known as “Low Wine” and is approximately 20% alcohol by volume. It is either stored for distillation at a future date (the higher alcohol percentage now acting as a preservative) or pumped straight back into the potstill for second distillation. The captured low wine is then returned to the potstill for a second distillation. Again the potstill is heated, and the same procedure followed in making cuts to the distillate, to retain only the desired flavours and aromas and ensuring that the unwanted ones stay out. The first cut of this distillate, known as the “Heads”, is removed the middle third, known as the “Heart” is retained, and the final third, known as the “Tails”, is also removed. The head and the tails contain the unwanted compounds, the hearts hold the desired flavoured and aromatic compounds most desired in the final Cape Brandy. 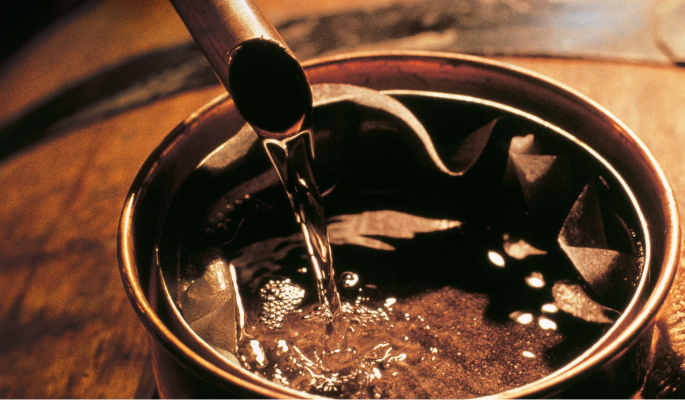 After the second distillation, the “Eaux de Vie” as the French like to call it, is roughly 70% alcohol. It is crystal clear, and full of aromatic flavours and tastes. 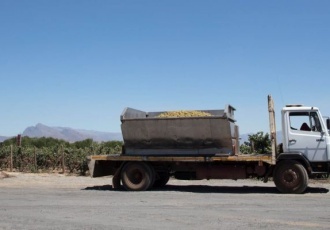 It is simply the heart of the grape, captured from the wine and concentrated twice to its most pure form. In performing this distillation process, 5 litres of base wine have been transformed into only 1 litre of new unaged brandy. Step 4: Transferring into Oak Barrels. The final step of the distillation process is to pump the cooled distillate from it’s holding tanks into the oak barrels in which it will mature. It is law in South Africa for all Cape Brandy to be matured for a minimum term of 3 years in small oak barrels in order to be called brandy. The magical process of Oak maturation will be discussed in detail in a future post, so keep reading our blog to learn more about the fascinating production of Cape Brandy.